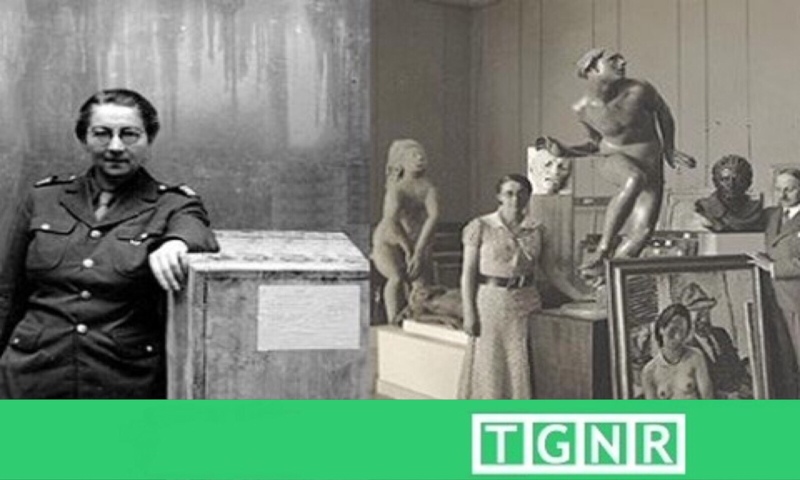 On V-E Day we honor the heroine of WW2 stolen French art, Rose Valland. She fooled the Nazis over four years, all to save the art they stole. With the recent 71st Anniversary of Victory in Europe Day, the conclusion of the Second World War in Europe, TGNR is commemorating one of the most astounding contributions during that struggle which is still largely unknown. Today Paul K. DiCostanzo recognizes Rose Valland, a savior of French artistic heritage who fooled the Germans for nearly four years directly under their collective nose. Rose risked everything in hope her work would held recover the immense amount of Nazi stolen art. The study of national security and military history has long been an interest of mine. It began when I was introduced to the topic of the Second World War by my father, and it sparked an enduring fascination in all aspects of the conflict. It always offers something new to be learned, something to be analyzed. As I have grown, and my research has advanced, I have come to certain conclusions. The first is an understanding that World War II was propelled out of a deep ideological struggle between civilizations, an unsurpassed struggle for collective identity. Ideological conflicts are often the most brutal, and always jeopardize destroying humanities greatest achievements. The second conclusion is that war is often fought on fronts distant from the front lines. Such a melee spurs the contribution of all peoples who’s lives are affected by the titanic undertaking of war. In World War II, there was an overwhelming amount of civilian contribution toward victory; including organized partisan resistance, human intelligence efforts, workforce mobilization, and leadership during the darkest of days. These are but a few examples of the many challenges met bravely by the people of the world during that period. It is one of the aims of TGNR to share the stories of determined individuals, perhaps not the likeliest of heroes, who manage to make a positive impact in spite of the chaos surrounding them. With all this in mind, meet Rose Valland: The museum curator and heroine who found herself a midst the chaos of May and June, 1940. Rose Valland is a national heroine of France and one of the most decorated women in French history. Her story remains largely unknown to the average person despite pivotal roles in one of the most pervasive unresolved elements of World War II: the unlawful seizure of art by Nazi Germany. In resisting the German effort, Rose Valland became an unlikely hero. Rose Valland was born in November 1898, in Saint-Étienne-de-Saint-Geoirs, Isère. Rose’s life and education was deeply founded in her lifelong love of art. Originally desiring to become a teacher, she underwent extensive training in art and art history, studying at prestigious schools in Lyon and Paris. Her life would take an unexpected and dramatic turn after accepting a position at the Jeu de Paume Museum in Paris as a volunteer assistant curator in 1932. The Jeu de Pame, Paris. On 25 June, 1940, the French government formally surrendered to Nazi Germany following their invasion a month prior. The French surrender marked the beginning of four years of German occupation and exploitation of France’s cultural treasures. Adolf Hitler was a failed artist, and one with an immense ambition to force his artistic vision on the world. Consequently, Germany undertook systematic looting of countless works of art, a mirrored act of organized plunder previously instituted in Austria, Czechoslovakia, and Poland. The French managed to conceal and protect several of their most valued pieces (e.g. The Mona Lisa), but not everything could be kept from sticky German hands. German forces seized public museum pieces and works from private collections alike with calculated brutality. Art had always been a prize of wars past, though German efforts regarding stolen art operated on an unprecedented scale, with a leader who’s appetite for art was insatiable. In doing so, they looked to conquer not just land, peoples and material resources of a nation. In fact it was also to take from conquered nations the jewels of their cultural identity, in so far as those jewels were not deemed “degenerate” by Nazi philosophy. The mission to confiscate art was one of the most devastating fronts of the Nazi ideological war. Following the fall of France, German occupation forces used the Jeu de Pame as throughput for confiscated art. From the Jeu de Pame, the Germans would send by rail all the works in their custody to galleries and individuals throughout the Reich. Rose Valland services were retained by German officials to act as head of the museum during that time. The position created the unique opportunity for Valland to become a singular hero of the French Resistance, as she recorded every detail regarding the fate of the pieces that passed through the museum. Directly under the noses of her German superiors, Valland used her prodigious memory to retain crucial facts: where works were shipped, who received them, and their purpose. Rose would go home each day and note these vital details on a secret hidden register. Yet her list was not the only crucial secret Valland kept. Rose undertook this perilous task in hope it would one day help recover the immense amount of Nazi stolen art. Valland possessed a working knowledge of the German language, and considerable contacts in the French Resistance. Valland was able to succeed because she recognized that the Germans viewed her personal character as nonthreatening, allowing her to operate above above suspicion. Valland looked and acted as the least likely candidate for organized resistance. Despite how she was perceived, Valland had no room for error. If even one of those secrets had become known to the Germans, it likely would have lead to her death as well as that of others. Despite the incredible risk of her activities, she assumed a critical role in saving France’s cultural heritage. Prior to the liberation of France in 1944, Valland used her contacts in the French Resistance to protect works being shipped on trains that were targeted for sabotage. In Valland’s ultimate tour de force, she arranged to stall final shipments of art just prior to the Allied liberation of Paris in August 1944. That last shipment was recovered by Free French forces shortly there after. In the aftermath of the fall of the Third Reich, her detailed records lead to innumerable pieces of art being identified, and recovered. Raphael’s “Portrait Of A Young Man.” A casualty of Nazi looting who’s location is still disputed as of 2015. The issue of stolen and destroyed art was a major consideration for the Allied powers as their battlefields were consistently within or interlaced with some of humanity’s greatest artistic achievements. As of 2015, the vast majority of works seized by Germany have still yet to be recovered. Of the many titles and decorations she received for her achievements by various Allied powers; the most prominent were being made a Commandeur of the Order of Arts and Letters, receiving the prestigious Ordre national de la Légion d’honneur, and the Médaille de la Résistance . From left to right: Médaille de la Résistance, Commandeur Ordre des Arts et des Lettres, Ordre national de la Légion d’honneur. Pearl Harbor in Perspective: What Happened Around the World the Day Japan Attacked? On the 71st anniversary of Victory in Europe Day, I try to keep in my thoughts the enormity of that achievement. Remembering that the scope of the Second World War required the bravery and sacrifice of many different people, provoking some to demonstrate courage in a way that only war could illicit. One may ask, “How is war good news?” War is not good news. However, even in humanity’s darkest moments, the efforts of people like Rose Valland demonstrate the goodness that is inherent to this existence. They are people who see the very essence of their greatest achievements in peril, and step forward to resist with whatever tools they may possess. There are many individuals with many astounding efforts during that conflict to whom we owe our greatest debt of gratitude. Remember the spirit of Rose Valland and others like her who risked everything to protect the better part of our nature.